Oofos Recovery Sandals Review & Giveaway! 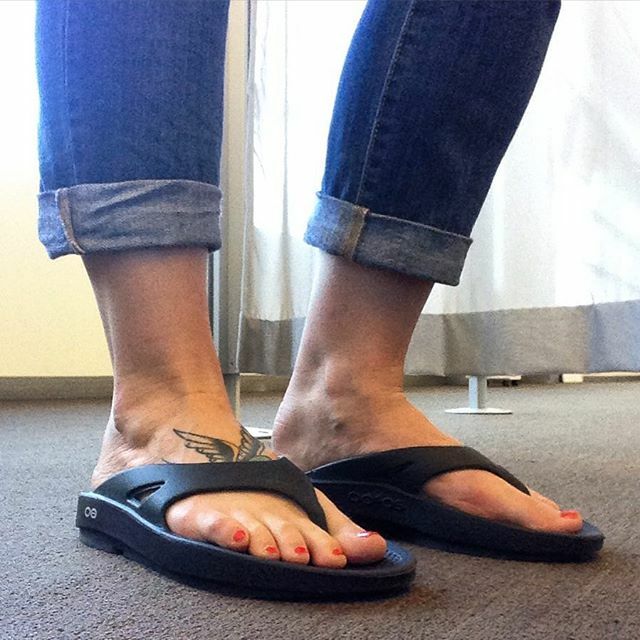 Last Christmas, I discovered some random no-name recovery sandals online and tried them out. They were too big so they made me trip, and they were ugly as sin so I couldn’t wear them outside the house, but they kind of helped. At least they were better than mushy, no-support slippers. Fast forward to early this summer when my training kicked into high gear and the giant pink sandals had to be retired because they’d lost their oomph (and GOD did they stink, TMI, I know). I was in dire need of supportive recovery sandals, and that’s when I discovered Oofos. After trying them on at my local Road Runner, I bought myself a pair of the Originals and promptly cursed myself for not getting them years sooner – they were amazing!! And because the folks at Oofos ROCK, I also recently got to try out the Oolala’s, a classed-up version of the Original. With a glossy, colored upper and a slimmer silhouette, they’re just as comfy as the Originals, only now I get to wear them with my dressier outfits at work! 4 months into owning these babies, I don’t think a day has gone by where I don’t wear them. Besides wearing them to work if I want, I slip them on as soon as I get home to give my joints a break, and don’t take them off til bedtime. And now that the weather is turning colder, you better believe I’m eyeing the clog styles so I don’t have to sacrifice comfort for warmth this winter! But enough of me talking about them – you know you want to try them, right? Well you’re in luck, because I’m teaming with Oofos to give away a pair of recovery sandals to THREE lucky readers! Just enter the giveaway here and check back next week to see if you’re a winner (contest is open to U.S. residents only). So what are you waiting for? Enter now – and good luck! I can’t get the link to work, but would love to be entered! These sandals sound amazing! ahh I’m seeing issues too! it’s definitely something with Rafflecopter though, this isn’t the first time I’m having issues with them 😦 sorry you’re having trouble, I’ll keep checking! Ok, I have IE on this computer and it’s not working, but I’ll try again from my home PC. Thanks! I’ve seen many runners wear these after a race and always wondered about the brand. They look super comfortable! Thank you for hosting the giveaway! Sweet! I could use some relief after running, and I’ve been hearing awesome thing about Oofos! I’ve been eyeing these for a while but just haven’t been able to take the plunge. I didn’t know that made a clog style.. Must go check that out!